The above introductory comments are edited excerpts from an article* by Michael Noonan (edgetraderplus.com) entitled Gold And Silver – Use “Magic” Of Gold/Silver Ratio To Greatly Increase Your Physical Holdings. The 15-year gold/silver ratio chart below offers a hindsight analysis…that can greatly increase net holdings at almost no cost other than transaction costs from a dealer. Buyer 1: a gold-only buyer who loves gold. Buyer 2: a silver-only buyer who loves stacking. Buyer 3: a buyer of either or both and who wants to maximize what he/she owns. Buyer 1 bought 20 ozt of gold for $380 the ounce, or $7,600. Buyer 2 bought 1,000 ozt of silver at $4.30 the troy ounce, or $4,300. Buyer 3 initially bought 20 ozt of gold with the intention to switch from gold to silver, or vice versa, based strictly on future developments in the silver to gold ratio. When the silver/gold ratio dropped to 80:1 (from the original 88.4:1) the gold was exchanged for 1,600 ozt of silver (20ozt x 80) in the belief that gold would likely do better than silver. In 1999, when the silver/gold ratio dropped to 50:1, the 1,600ozt of silver was converted back into gold which amounted to 32ozt (1,600 divided by 50 = 32). Not bad. Buyer 3’s original 20 ozt of gold now became 32 ozt irrespective of market price. It was the relationship between the two that mattered. 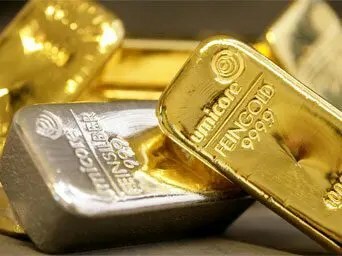 In 2003, when the silver/gold ratio bounced back to 80:1, the 32 ozt of gold was switched into 2,560 ozt of silver (32×80 = 2,560) which gave Buyer 3 an additional 960ozt from his last switch. Just like Buyer 1 and Buyer 2, Buyer 3 was at no risk of loss because he was always invested in one metal or the other. In 2006, when the silver/gold ratio declined back to 50:1, the 2,560 ozt of silver was switched into 51ozt of gold (2,560 divided by 50 = 51ozt). The original 20ozt had first become 32 ozt, and had become 51 ozt. Price was immaterial to his plan. In 2009, when the silver/gold ratio hit 80:1 again, the 51 ozt of gold was switched into 4,080ozt of silver (51×80 = 4,080). His application of the “magic” of the silver/gold ratio was working as planned, according to a few simple rules, his 80/50 rule, we will call it. In 2011, when the silver/gold ratio came back to 50:1, Buyer 3 took his 4,080 ozt of silver and switched them for 81 ozt of gold. hedge one’s bet, as it were, and just switch half of one’s gold holdings into silver at 63:1 and if the ratio does go back to 80:1, switch the remainder. If the ratio goes no higher than it has for the past 4 years (68:1) and starts to decline lower, switching half one’s holdings at 63:1 makes sense. What to do with the other half? What if 63:1 is a new high, maybe 35:1, or lower can become a new low? There are always decisions to consider, but there are none that are right or wrong. Buyer 1′s buy gold and hold strategy saw the value of the original 20ozt of gold increase to $26,000. Buyer 2’s buy silver and hold strategy saw the value of the original 1,000ozt of silver increase to $20,000. Buyer 3’s holdings have become 81ozt of gold, up from the original 20ozt and the original investment of $7,600 is now worth $105,300. Buyer 3 held a more pragmatic belief in the magic of the gold/silver ratio, as opposed to buying and holding one or the other. 2. Gold Bullion: What’s the Difference Between 1 Troy Ounce and 1 Regular Ounce?